First, the bad news: New York is just as expensive as you've heard, if not more so. But it's also constantly undergoing transformation, which means that when you live here, the exploration never ends. And you can find pockets of affordability—in fact, there are enough spots that there's something for everyone, whether you want a place that lets you paint on massive canvasses in a converted warehouse loft, catch a baseball game every week, eat your way around the world without leaving a five-block radius, or simply put down roots in a family-oriented, tight-knit community. 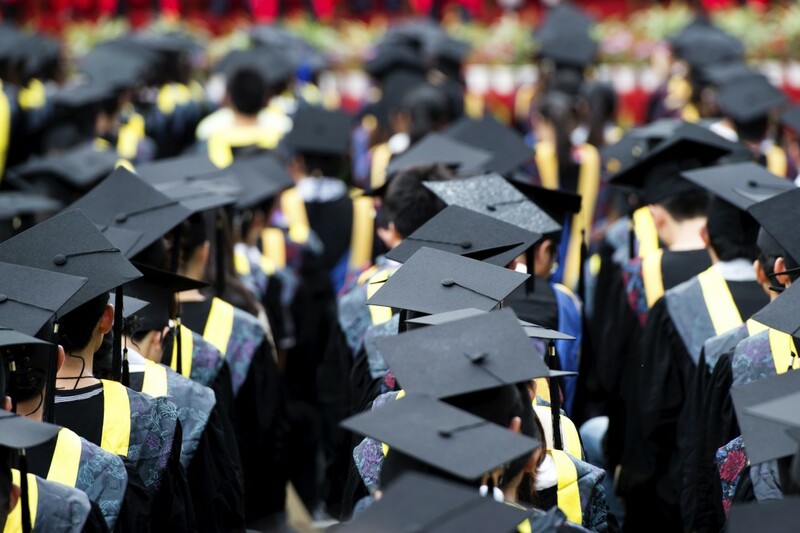 You'll find the right match for all of these inclinations on this year's list of the best neighborhoods for college graduates. Need help finding the perfect starter apartment in the perfect neighborhood--or a landlord inclined to be flexible about guarantors, work history, rental history, or "flexing" your space with temporary walls? Put your search into the capable hands of Triplemint, a tech-savvy real estate brokerage founded by a pair of young Yale grads in response to the frustrating apartment-search experiences of classmates and colleagues. Triplemint will charge a broker's fee of 10 percent of a year's rent on open listings instead of the usual 12 to 15 percent if you sign up here. Bonus: The agents at Triplemint are a delight to deal with. A bit about our methodology: We began by asking StreetEasy to crunch the numbers and give us a list of the neighborhoods with the most affordable median rents in each borough. Then, we turned to Peter Goldey of WitLytic.net, who, using data from Synergos Technology, shared statistics on crime, along with information on entertainment and nightlife options, as well as the local population of people age 20-24, in those affordable spots. Finally, we considered the commute time from each place to the Financial District and Midtown. Taking into consideration these factors, we culled our list to a final ten. 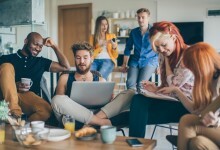 Each neighborhood is also ranked on a scale of one to five on nightlife (the number of restaurants, cafes, and bars, relative to its size), affordability (based on median rents), cool factor (the presence of other young people and places to socialize with them), convenience (commute time to downtown and midtown Manhattan), and whether they could be easily "parent approved" (based on local crime statistics). 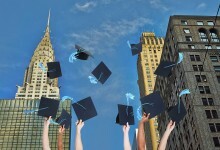 In the interest of looking ahead and anticipating where the class of 2017 might end up, we skipped some neighborhoods that are already especially popular with college grads, including Bushwick, Crown Heights, Washington Heights, Astoria, and the Lower East Side. But you can read our guides from 2016 and 2015 if you want to know what life is like there. 1. 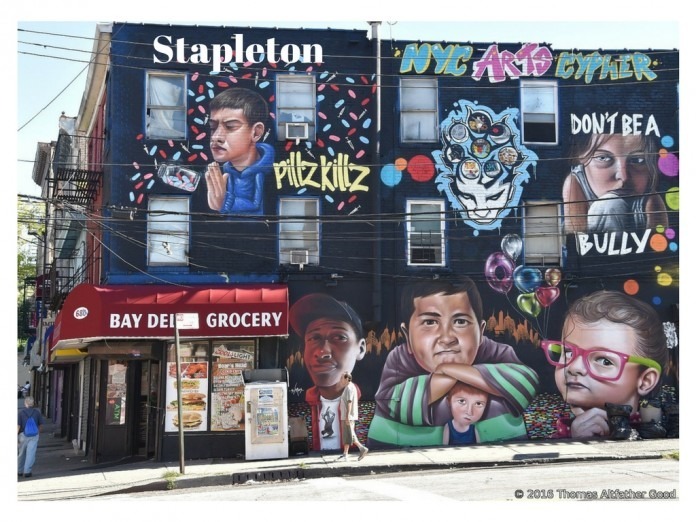 Bedford-Stuyvesant (Brooklyn) Of all the neighborhoods on this year’s list, Bed-Stuy may be the one that can best deliver something for everyone. 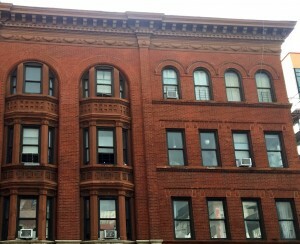 Architecture buffs will love walking streets lined with remarkably well-preserved brownstones. Food lovers will be enticed by the neighborhood’s many restaurants, bars, and cafes. Cyclists will appreciate the ease of biking to almost anywhere in Brooklyn from this central location, including nearby Prospect Park. 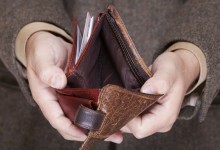 All that, and it’s still relatively affordable. John Antrim-Cashin, a broker with TripleMint (a Brick Underground partner), says you can find studios for $1,400-$1,700, one-bedrooms for $1,500-$2,000, and two-bedrooms for $1,700-$2,400. 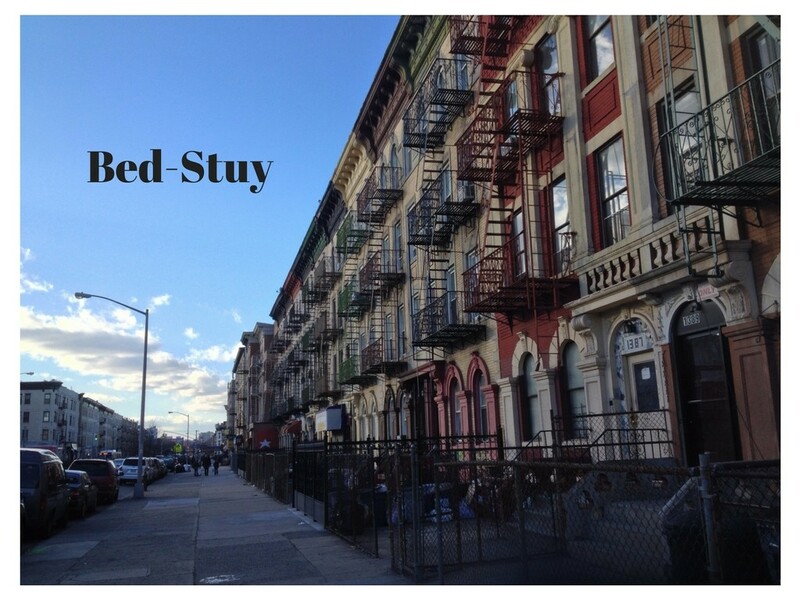 Bed-Stuy’s unique history has led to a pride of place that’s immediately apparent, Antrim-Cashin says. 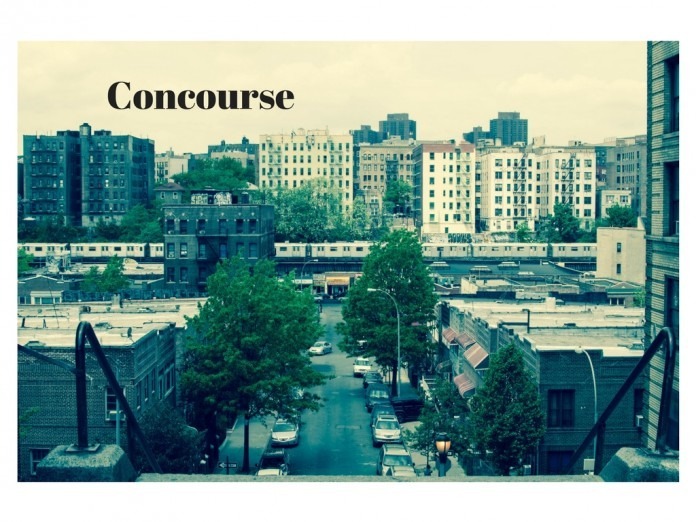 Your commute time to Manhattan will depend on where you live in the large neighborhood, but within Bed-Stuy you’ll find A, C, G, J, M, and Z train stations. No surprise, then, that Schleider says Bed-Stuy is rapidly developing, and landlords are renovating in the hopes of raking in higher rents. “You see a work permit in almost every window,” he says. This can mean a threat to the neighborhood’s affordability, but renters can also expect high-quality housing stock. “You can rent from independent owners of brownstones. Management-wise, a lot of owner-operators have a relationship with their tenants, which is really positive in our experience,” he says. 2. East Harlem (Manhattan) It isn’t easy staking out your spot in Manhattan these days, especially if you’re also dealing with student debt and an entry-level salary: The latest market reports from Douglas Elliman found that the median rent in the borough is a whopping $3,400 per month. But there is still affordability—and plenty of other pluses—to be found uptown. 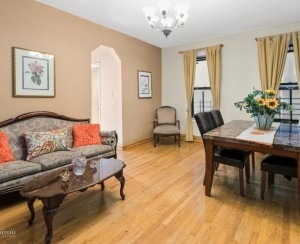 Thomas Rodriguez, a broker with Bohemia Realty, says that studios and one-bedroom rentals can be found in East Harlem for a relatively reasonable $1500-$1700, and besides that, the area is busier than ever. In addition to the green space, which sits right beside the Harlem River and includes a pool, skate park, basketball courts, and a soccer field, several new bars and restaurants have arrived in the neighborhood, like the craft beer-focused East Harlem Bottling Company and burger joint Harlem Shake. There are lots of East Harlem stalwarts, too: New York Eater has a rundown of the top spots serving Mexican, Dominican, Italian, and more. As in many New York neighborhoods, though, longtime residents, many of them Latino, are concerned about development diminishing the character they've brought to East Harlem. This concern has only been amplified by a planned rezoning of the neighborhood. 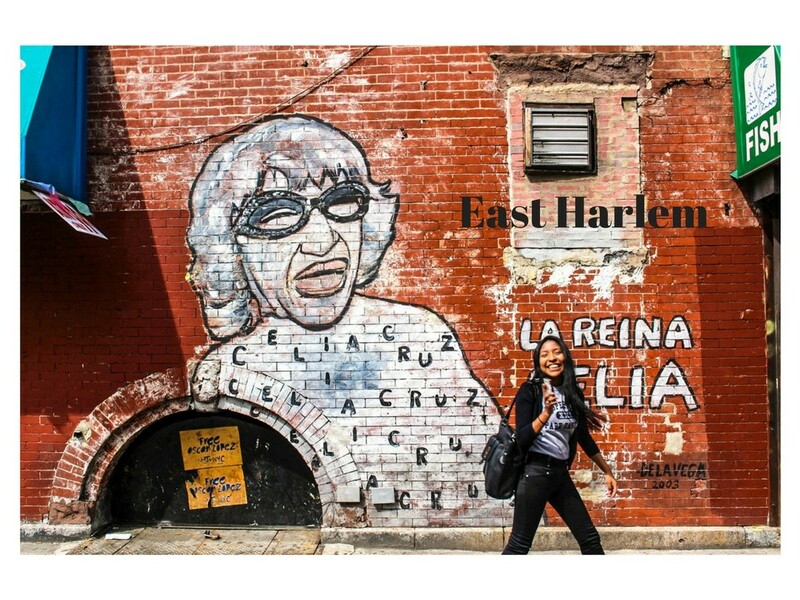 For now, though, East Harlem remains one of Manhattan's most affordable neighborhoods, albeit one that is undergoing changes. “You don’t have to go all the way downtown for a bite to eat and a cocktail now,” Rodriguez says. But if you are heading downtown for work, the Lexington line will deliver you to Grand Central in about 25 minutes, and the Financial District in around 40. And if you’re close to 96th Street, you can travel by the shiny new Second Avenue subway. 3. Hamilton Heights (Manhattan) Further uptown and to the west sits Hamilton Heights, appearing on our list for the second year running as it continues to deliver the affordability, convenience, and friendly feel that so many college grads are seeking. 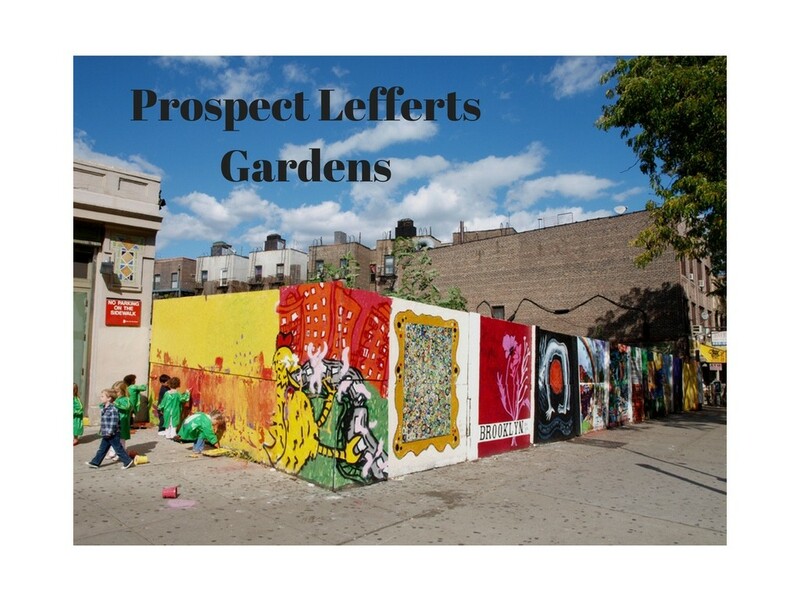 But like East Harlem, the landscape of the neighborhood is changing quickly, meaning now may be the time to get in. 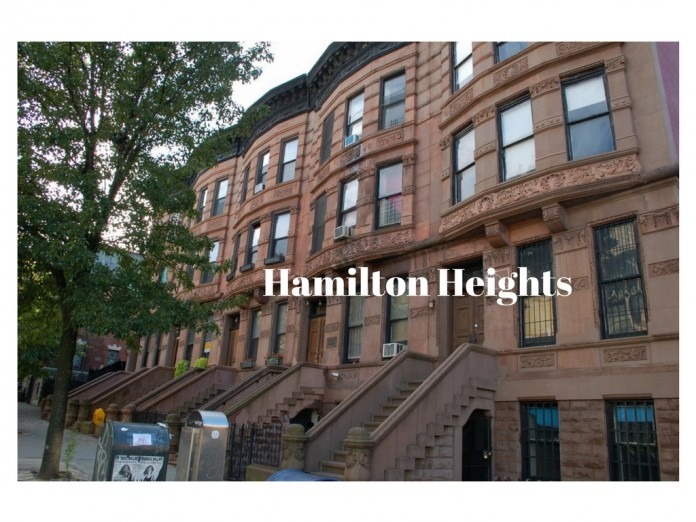 Jacob Corbett, a broker with Bohemia, moved to Hamilton Heights in 2013 and got to know longtime locals by spending time at the Hogshead Tavern, a beer bar just north of City College. “I’ve asked them over the past 10 years, when have you seen the most change, and everyone says these last two years,” Corbett says. Those changes involve new bars and restaurants popping up—like whiskey bar Uptown Bourbon—as well as rentals coming back onto the market after extensive renovations. Other beloved neighborhood spots include the Chipped Cup coffee shop and the Handpulled Noodle, for northwestern Chinese eats. Those newly revamped units will cost you, but Corbett says that for college grads seeking shares, there are still three-bedrooms for $3,000 and four-bedrooms for $4,000 in older buildings, if you’re comfortable with fewer bells and whistles. 4. Ridgewood (Queens) Right on the border of Brooklyn and Queens, Ridgewood comes across as a blend of Brooklyn’s edginess and Queens’ international and down-to-earth vibe. When Brick spoke to bloggers from Ridgewood Social, they recommended standbys like beer hall Gottscheer Hall, and newcomers like Peruvian ice cream spot Creme and Sugar. Seneca and Woodward Avenues are home to a number of shops and eateries as well, including Topos Bookstore Café and coffee shop Milk & Pull. Barrocas says that Ridgewood is ideal for college grads who want to hold onto the social aspects of dorm living: Like Bushwick, he says, its housing stock includes a number of converted warehouse spaces, as well as multi-family apartment buildings, both of which are conducive to shares. "Up until recently, there really hasn't been a lot of different types of product," Barrocas says of the housing. "But now new construction is coming into the mix." MNS’s most recent market report found that the average two-bedroom in the area rents for $2,533 per month. Studios, if you can find them, average $1,500, the lowest of the Queens neighborhoods the brokerage looked at. The neighborhood includes three M train stops, which makes getting to Midtown a slightly onerous, but not too painful 45-minute journey. It’s a quicker ride to the Lower East Side, about 25 minutes. 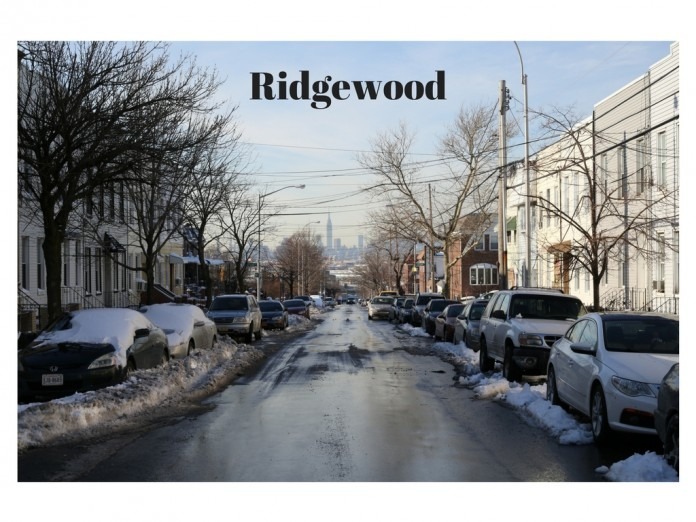 Another factor to be aware of: WitLytic's data reveals that relative to the other neighborhoods on our list, Ridgewood has a higher rate of both property and personal crime, which might raise a few parental eyebrows. 5. 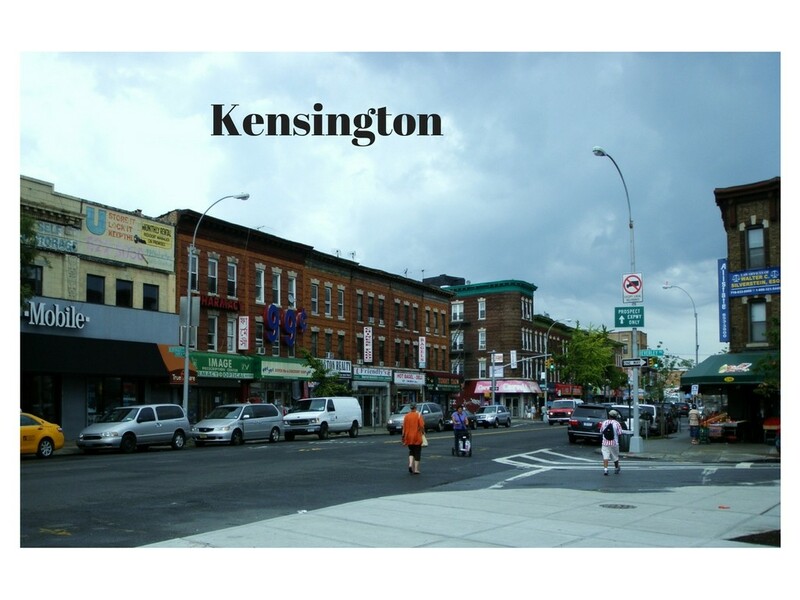 Kensington (Brooklyn) There are few neighborhoods left that offer renters proximity to Prospect Park without decimating their bank accounts, but Kensington, wedged between Windsor Terrace, Flatbush, and Borough Park, definitely qualifies. He says newcomers can find two-bedrooms in the low $2,000s, and sometimes even lower—though with renters trickling down from pricier areas like Brooklyn Heights, landlords are beginning to spruce up older units to appeal to them. This can mean rising rents, but Kensington is also home to its share of rent-stabilized, prewar buildings along Ocean Parkway that remains inexpensive. One potential con: According to WitLytic's data, Kensington's personal crime index is on the high side, at 138 (the index in nearby Prospect Lefferts Gardens, by contrast, is only 66). Proximity to Park Slope is another advantage, and when it comes to heading into Manhattan, there’s access to both the G and F trains. Being deeper into Brooklyn, Kensington offers a decent commute to the Financial District (about 45 minutes), though the journey to Midtown is lengthier. But respite from the city is a quick walk away with all that the 585-acre Prospect Park offers. PLG definitely has an edge on Kensington when it comes to travel times, with Q, 2, and 5 train stations all nearby, and offering a commute to the Financial District of around 30 minutes, and to Midtown of about 45. Moreover, its total crime index is the lowest of any neighborhood on our list. “It’s also fairly easy to get to Crown Heights, which offers a lot of nightlife along Franklin Avenue,” Mangiameli says. And while the small neighborhood has less of a thriving scene than, say, Bed-Stuy, PLG’s diversity shows in its restaurants, including Israeli restaurant Kulushkat, Trinidadian eatery De Hot Pot, and burrito spot El Patron. 7. Jackson Heights (Queens) If one of the things that makes you want to move to New York is the food, Jackson Heights is a good match. The Queens neighborhood may be the most international one in a famously international borough, and its blend of cultures was at the center of Frederick Wiseman’s 2015 documentary, In Jackson Heights. It has seen waves of immigration from Latin America, South Asia, and more recently, the Himalayas, which has resulted in an abundance of authentic eateries. You can find Colombian arepas, Tibetan momos, and Indian dosas within the same block. The neighborhood is also the go-to spot for LGBT nightlife in Queens, with a number of bars and clubs along Roosevelt Avenue. Many of these spots also offer hookah service. The architecture is worth exploring as well: In a Times “Block by Block” video, locals sing the praises of the area’s many historic co-op buildings, which facilitate community through their shared courtyard gardens. A StreetEasy search shows that one-bedroom co-ops can be found starting at $218,000, and two-bedrooms at $265,000. The cost of rentals here, though on the rise, remains reasonable, especially when compared to northwest Queens neighborhoods like Long Island City and Astoria. 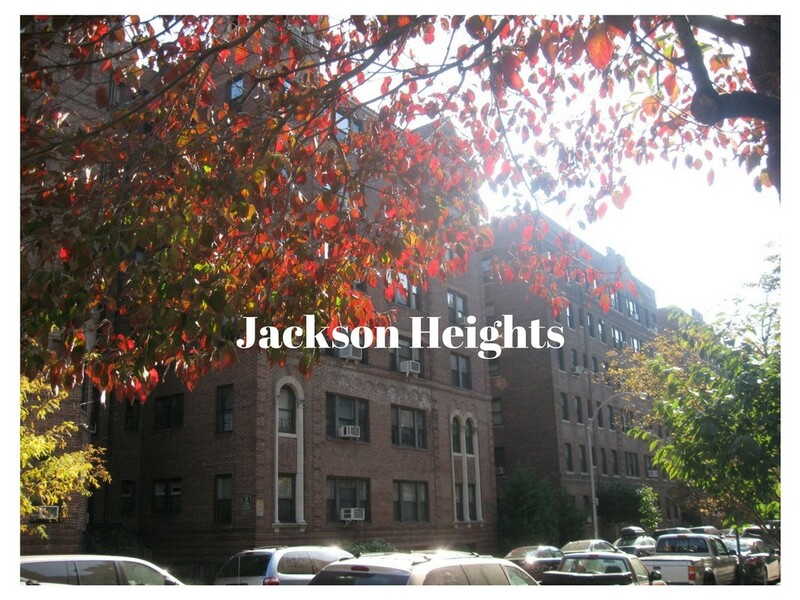 MNS’s March market report found that the average Jackson Heights studio costs $1,489, while one-bedrooms are around $1,828 and two-bedrooms around $2,258. 8. 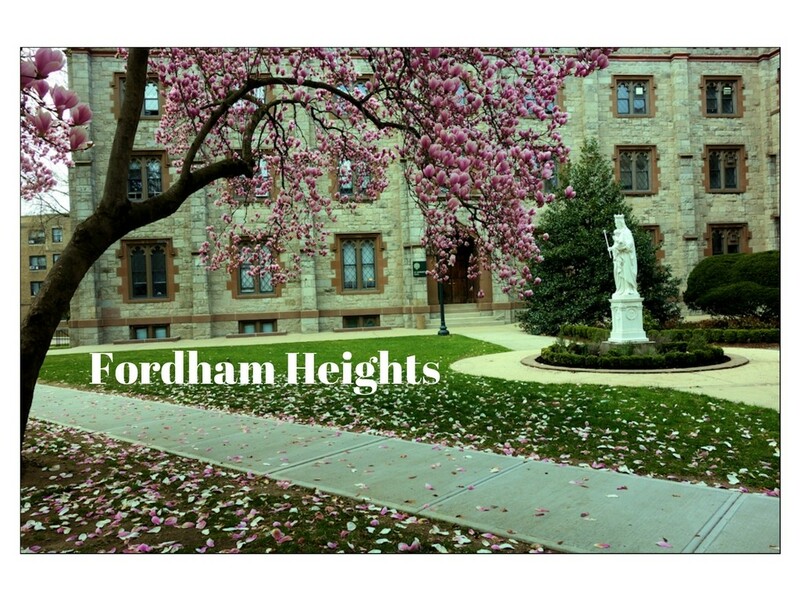 Fordham Heights (Bronx) If you’re reluctant to fully leave college life behind, consider this Bronx neighborhood that shares a name with Fordham University, where the presence of a sprawling campus may help ease that painful transition to the working world. And for the outdoorsy, there’s additional, plentiful green space to be explored in the nearby New York Botanical Garden, the largest of its kind in the United States. Sarprong says, “What’s great about the Bronx are the things they’re ramping up,” she says, citing a new Macy’s on Fordham Road, and nightlife spots like Salsa Con Fuego. WitLytic data reveals that the population here is also the youngest of all the places Brick looked at, with almost nine percent of locals between 20 and 24. Tradition is also alive and well here: Nearby Arthur Avenue, which dubs itself Little Italy in the Bronx, offers some of the best Italian dining in the city. And though Manhattan isn’t far away, your dollar will stretch far further here. According to StreetEasy, Fordham's median asking rent is the lowest of all the neighborhoods on our list, at $1,425. 9. Concourse (Bronx) The appeal for baseball fans is obvious: Yankee Stadium sits at the center of Concourse. But the southwest Bronx neighborhood offers plenty to those who aren’t sporty, too. Sarpong says that there is increased interest—and investment—in the area, including in a new movie theater, shopping mall, and restaurants. Sarpong lives in the area, and finds the commute to be a breeze. “I take the D train and get to my office on 59th Street in 20 minutes,” she says. That proximity to Manhattan does mean rentals are a bit pricier than what you might find in other corners of the Bronx, but still far cheaper than in Manhattan: Expect to see studios listed for $1,100-$1,300. Concourse should also be of interest to architecture and history buffs. The Grand Concourse thoroughfare for which it’s named has been called the “Champs-Élysées of the Bronx,” and is lined with impressive Art Deco and Art Moderne buildings. The road is also home to the Bronx Museum of the Arts, a contemporary art museum in the midst of a $25 million expansion. Let’s say you’d rather gaze at the urban madness from across a waterfront vista than be immersed right in the middle of it. Some days, we can hardly blame you. If you’re inclined toward a suburbs-in-the-city vibe, Stapleton could be a good fit: The Staten Island neighborhood sits right on New York Bay, and offers impressive views of the Verrazano Bridge and the skyline beyond. It’s a setting that URBY, a massive new rental development, is making the most of. The amenity-packed complex may appeal to college grads for how it strives to facilitate socializing, whether at its outdoor pool, communal kitchen, and on-site farm. It follows, though, that renting here will cost more than elsewhere in the neighborhood; expect one-bedrooms over $2,000 and two-bedrooms starting at $3,200. Elsewhere, you can snag a two-bedroom for a more reasonable $2,765. According to Trulia, the median rent in the borough is $2,300. Still, let's be frank: Transportation will be a headache. 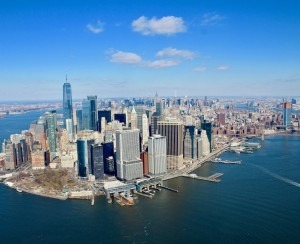 Though it's close to the ferry terminal—two stops away on the Staten Island Railroad or about a half-hour walk along Bay Street—you will still need to hop on that ferry everyday (though it's free, at least), or drive to the city, which will have you going through Brooklyn, so yes, it will be a pain. In short, everyday commuting could be a hassle, unless you work way downtown. Stapleton is drawing foodies who know about the area’s Sri Lankan community to restaurants like New Lakruwana. There are also new coffee shops and craft beer bars, those surefire signs of growing interest from younger New Yorkers.